Posted March 29, 2018 by Shelley Gist & filed under Featured News. 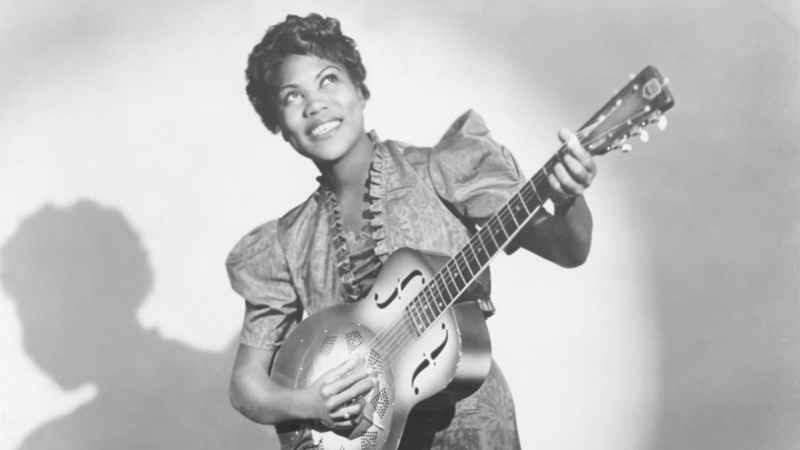 Daughter of Katie Bell Nubin, a well-known singer in her own right, Sister Rosetta Tharpe, born Rosetta Nubin, started performing on stage with her mother when she was just four years old. Her mother was a singer and mandolin player as well as a popular evangelical preacher for the Church of God in Christ, a Christian denomination founded by a black Baptist bishop named Charles Mason in 1894. The church encouraged musical expression as a form of worship and, in a radical move for the time, allowed women to preach. Tharpe’s mother was one such preacher from the church and performed on stage with her daughter at church conventions and traveling shows across the country. Something of a musical prodigy, Tharpe became a regular fixture of her mother’s traveling tour group at the age of six, playing the guitar and singing in her mother’s hybrid sermon and gospel concert performances. She and her mother settled down in Chicago, Illinois in the mid-1920s as part of the Great Migration, or the broader movement of African Americans moving north in response to post-Reconstruction backlash, where she gained considerable popularity at a time when black female guitarists were rare – Memphis Minnie was the only other guitarist to gain such national popularity. In 1934, Tharpe married Thomas Thorpe at 19. Although their marriage only lasted a short time, she used his surname as inspiration for her stage name, . In 1938, she moved to New York City and signed with Decca Records, becoming the label’s first gospel singer and racking up four national hits in October of that year alone. Tharpe became known for her gospel-style that incorporated styles of urban blues, jazz, and swing music with a distinct pulsating beat. In fact, despite being classified as a gospel artist, her style of music is actually part of early rock and roll music and the precursor to much of the later genre. She went on to play an electric guitar in a song titled “That’s All” which had a great influence on later rock and roll artists like Chuck Berry and Elvis Presley. Tharpe was also in an “open secret” relationship with fellow performer Marie Knight, with whom she collaborated in 1953 to record a secular blues album. Although this album was less popular than any of Tharpe’s previous ones and drew a lot of criticism and condemnation from her religious fan base, Tharpe and Knight continued in a relationship for several years. Tharpe is now regarded as one of the most popular queer black musicians of her time. Her 1940s popularity has never been seen for gospel musicians before or since. Tharpe spent most of the ‘50s, ‘60s, and early ‘70s touring Europe and the United States until she suffered a stroke and had to have her leg amputated. She continued touring and performing for three years after that, until she suffered a second stroke and died three days later. She was inducted into the Rock and Roll Hall of Fame’s “Influences” category in 2017 and credited with pioneering the guitar technique that later artists Chuck Berry, Elvis, and Eric Clapton would continue to develop. Rosetta Tharpe truly was the queer black godmother of the modern rock and roll music movement and she continued to shape the music landscape decades after her death.